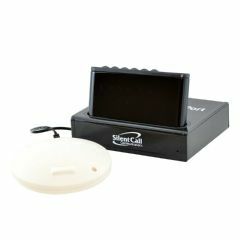 AllegroMedical.com presents The Silent Call Signature Series Vibra-Call 3 Receiver. The Signature Series Vibra-Call 3 Receiver works with Signature Series 418Mhz transmitters to alert you by lighting up the corresponding LED icon, vibrating alerts and push buttons that will turn off the signaling when the correct button is pressed. It includes a carry case that can be clipped to your belt, so you can always keep it close.